Requires simple screwdriver with predrilled holes for display. Versatile and easily assembled racking system. Create a countertop display, a floor display or design a custom cellar. Easily expandable. Reconfigure shelving as your needs. Eco-friendly and sustainable. Water based UV coatings. Racking will hold most standard 750 ml bottles. Smooth rounded edged shelves for maximum bottle label safety. 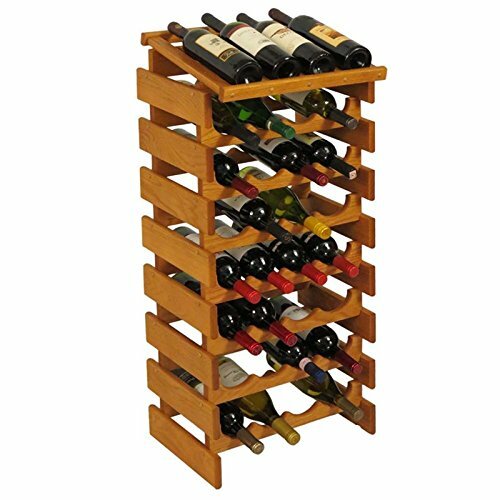 4 bottle wide x 8 shelf high configuration. Warranty: One year. Made from solid oak. Made in USA. Assembly required. 17.7 in. W x 12.9 in. D x 39.5 in. H (18 lbs. ).